Our Fowler Ploughing Van offers a unique opportunity to experience life as a travelling ploughman back in the 1860s. Built in 1868, it sleeps up to 4 people, two in a double bed and the 2 day seats can also be used for 2 additional beds if required. 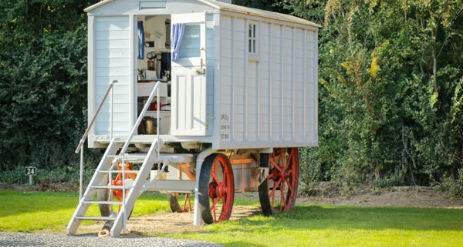 Our luxury Shepherds Hut is located in a private, gated and secluded corner overlooking our wildlife pond and open countryside with parking space for up to 2 cars. 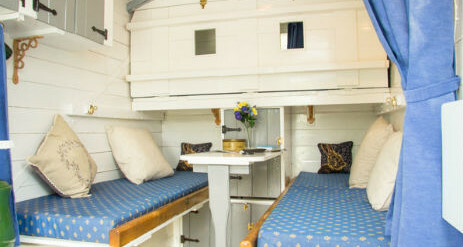 The Luxury Shepherds Hut also has the benefit of exclusive use of the landing stage, gas BBQ and outdoor table and chairs. 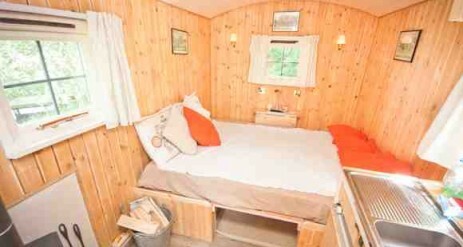 The Shepherds Hut is fully insulated and is connected to mains electric. 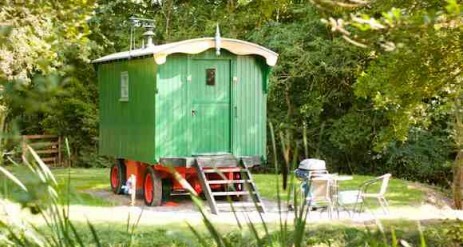 Our Traditional Shepherds Hut is located in a quiet corner overlooking our wildlife pond and open countryside. 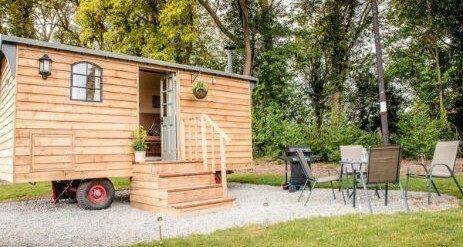 The Shepherds Hut is fully insulated and is connected to mains electric. The Family shepherds hut offers a great opportunity for true Glamping whilst exploring the lovely countryside around the Malvern Hills. 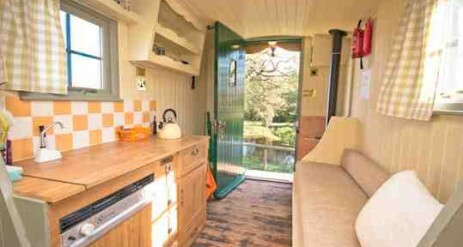 The Family Shepherds Hut is fully insulated and is connected to mains electric. “Lovely setting, instantly felt at home and on holiday. Dog welcome if kept on a lead at all times. The classic caravan is located close to our wildlife pond and enjoys views over open farmland. Our 2 Berth Classic Caravan (2 x singles or one double bed) is fully equipped with Shower, Toilet, Electric Heating, Fridge/Freezer, Oven/Hob/Grille, as well as TV/DVD/Radio/CD. The classic caravan also has the benefit of outdoor table and chairs. All you need to bring is your bedding, towels and basic provisions. Our 2 Berth Luxury Caravan (2 x singles or one double bed) is fully equipped with Shower, Toilet, Electric Heating, Fridge/Freezer, Oven/Hob/Grille, as well as TV/DVD/Radio/CD. The Luxury caravan also has the benefit of outdoor table and chairs. All you need to bring is your bedding, towels and basic provisions. For your convenience, you’re welcome to use our new shower and toilet block only 75 metres away, together with waste disposal facilities for your rubbish. Our site is only ten minutes from the historic market town of Ledbury where apart from the usual supermarkets there are a wealth of independent shops selling local produce. Receive 2 nights for the price of 1 when you stay here in January and February 2019 (excluding school holidays ).